Replicas of the gold plates and breastplate with the Urim and Thummim. Replicas by David Baird, Photograph by Daniel Smith. When the 116 pages of the book of Lehi were lost in July 1828, the plates and the interpreters were taken back by the angel Moroni. But then in September, 1828, Moroni returned them to Joseph.5 He commenced translating again in earnest two days after Oliver Cowdery arrived on April 5, 1829. After the translation was finished, the plates and interpreters were returned again to Moroni, who showed them to the Three Witnesses. Whatever the particular details may have been, it is clear that the breastplate and interpreters were linked artifacts and that they were prepared for the purpose of translation.9 Soon, the early Saints recognized that Joseph’s translation instruments were similar to the Urim and Thummim from the Old Testament, and they began to interchangeably refer to them by this biblical term.10 Joseph himself referred to them as the “Urim and Thummim” as early as 1836.11 Some may wonder, though, how closely and in what ways Joseph’s New World artifacts were related to their Old World counterpart? There will likely continue to be scholarly debates about what the biblical Urim and Thummim was and how it functioned. Yet non-LDS scholars such as Van Dam have fairly recently been reaching conclusions that strengthen the possible links between the Urim and Thummim and Joseph Smith’s translation instruments.27 Joseph and the early Latter-day Saints, therefore, were certainly not incorrect to make this association themselves. It should be noted, however, that Joseph’s conception of a Urim and Thummim was fairly broad. He taught that the “place where God resides is a great Urim and Thummim” and that “this earth, in its sanctified and immortal state, will be made like unto crystal and will be a Urim and Thummim to the inhabitants who dwell thereon” (Doctrine and Covenants 130:9). Moreover, he said the “white stone mentioned in Revelation 2:17, will become a Urim and Thummim to each individual who receives one …. And a white stone is given to each of those who come into the celestial kingdom, whereon is a new name written, which no man knoweth save he that receiveth it. The new name is the key word” (Doctrine & Covenants 130:10). Alma prophesied that the Lord’s servant would obtain “a stone, which shall shine forth in darkness” (Alma 37:23), and that he would also obtain the Nephite interpreters which would “bring forth [ancient records] out of darkness unto light” (v. 25). Surely, this servant was Joseph Smith, who variously used the Nephite interpreters as well as a seer stone to translate the Book of Mormon by the gift and power God. While Joseph’s instruments were different in some respects with what is known about the biblical Urim and Thummim, these sacred cousins are certainly similar enough to be called by the same name. Each of them helped the “word of God … shine forth out of darkness, and come unto the knowledge of the people” (Mormon 8:16). Michael Hubbard MacKay and Gerrit J. Dirkmaat, From Darkness unto Light: Joseph Smith’s Translation and Publication of the Book of Mormon (Salt Lake City and Provo, UT: Deseret Book and Religious Studies Center, Brigham Young University, 2015), 61–140. Roger Nicholson, “The Spectacles, the Stone, the Hat, and the Book: A Twenty-first Century Believer’s View of the Book of Mormon Translation,” Interpreter: A Journal of Mormon Scripture 5 (2013): 136–139. John A. Tvedtnes, “Glowing Stones in Ancient and Medieval Lore,” in The Book of Mormon and Other Hidden Books: “Out of Darkness Unto Light” (Provo, UT: FARMS, 2000), 195–225. Matt Roper, “Revelation and the Urim and Thummim,” in Pressing Forward with the Book of Mormon: The FARMS Updates of the 1990s, ed. John W. Welch and Melvin J. Thorne (Provo, UT: FARMS, 1999), 280–282. 1. See Book of Mormon Central, “Is There Evidence That Joseph Smith Possessed a Urim and Thummim and Breastplate? (Ether 4:5),” KnoWhy 409 (February 20, 2018). 2. John W. Welch, “The Miraculous Timing of the Translation of the Book of Mormon,” in Opening the Heavens: Accounts of Divine Manifestations, 1820–1844, ed. John W. Welch, 2nd edition (Salt Lake City and Provo, UT: Deseret Book and BYU Press, 2017), 138, doc. 28. 3. See Michael Hubbard MacKay and Gerrit J. Dirkmaat, From Darkness unto Light: Joseph Smith’s Translation and Publication of the Book of Mormon (Salt Lake City and Provo, UT: Deseret Book and Religious Studies Center, Brigham Young University, 2015), 88–90. 4. On about July 1, 1830, Joseph was tried a final time in Broome County, New York, on charges of being a disorderly person. 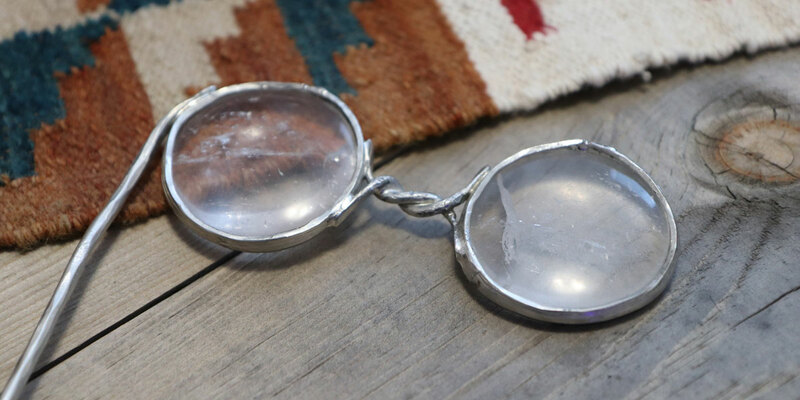 As on previous occasions, he was once again acquitted, this time because there was convincing testimony that Joseph had not looked “in the glass within the space of two years last past.” This would mean that he had not used whichever glass (seer stone) was in question between July 1828 and the end of June 1830. See Gordon A. Madsen, “Being Acquitted of a ‘Disorderly Person’ Charge in 1826,” in Sustaining the Law: Joseph Smith’s Legal Encounters, ed. Gordon A. Madsen, Jeffrey N. Walker and John W. Welch (Provo, UT: BYU Studies, 2014), 92, 464. 5. According to David Whitmer, when Joseph was again permitted to translate, he “was given by the angel a Urim and Thummim of another pattern, it being shaped in oval or kidney form.” See Welch, “The Miraculous Timing,” 173, doc. 95. For more on the possible distinctions among Joseph Smith's translation instruments, see Michael Hubbard MacKay and Nicholas J. Frederick, Joseph Smith’s Seer Stones (Salt Lake City and Provo, UT: Deseret Book and Religious Studies Center, Brigham young University, 2016). 6. Welch, “The Miraculous Timing,” 159, doc. 72. 7. Welch, “The Miraculous Timing,” 192, doc. 122. Apparently, the hat helped block out ambient room light and allowed Joseph to more clearly see the illuminated words through the stone. See also, Richard E. Turley Jr., Robin S. Jensen, and Mark Ashurst-McGee , “Joseph the Seer,” Ensign, October 2015, online at lds.org; “Book of Mormon Translation,” Gospel Topics, online at lds.org. 8. See, for example, Welch, “The Miraculous Timing,” 130–140, docs. 9, 10, 11, 16, 20, 21, 22, 26, 28, 32. 9. See MacKay and Dirkmaat, From Darkness unto Light, 88–89. 10. See Roger Nicholson, “The Spectacles, the Stone, the Hat, and the Book: A Twenty-first Century Believer’s View of the Book of Mormon Translation,” Interpreter: A Journal of Mormon Scripture 5 (2013): 136–139. 11. Welch, “The Miraculous Timing,” 135, 140, docs. 23, 32. 13. See Cornelis Van Dam, The Urim and Thummim: A Means of Revelation in Ancient Israel (Winona Lake, IN: Eisenbrauns, 1997), 155; for Van Dam’s full argument see pp. 154–160. 14. Peterson and Pender, interview of William Smith, 7, as cited in MacKay and Dirkmaat, From Darkness unto Light, 89. 15. Matt Roper, “Revelation and the Urim and Thummim,” in Pressing Forward with the Book of Mormon: The FARMS Updates of the 1990s, ed. John W. Welch and Melvin J. Thorne (Provo, UT: FARMS, 1999), 280. 16. Van Dam, The Urim and Thummim, 216. 17. Van Dam, The Urim and Thummim, 217. 18. Welch, “The Miraculous Timing,”121–125. 19. Although there is no scholarly consensus on the etymology of these words, Van Dam has argued that “light(s)” and “perfection(s)” is likely their meaning in the Masoretic Text of the Bible. Van Dam, The Urim and Thummim, 136. 20. See Van Dam, The Urim and Thummim, 9–38. 21. Van Dam, The Urim and Thummim, 23. 22. Van Dam, The Urim and Thummim, 32. 23. Welch, “The Miraculous Timing,”170, doc. 91. 24. Welch, “The Miraculous Timing,” 173, doc. 96. 25. Welch, “The Miraculous Timing,” 169, doc. 90. 26. Welch, “The Miraculous Timing,” 189, doc. 119. 27. For other relevant non-LDS publications, see C. Houtman, “The Urim and Thummim: A New Suggestion,” Vetus Testamentum 40 (April 1990): 231; Shimon Bakon, “The Mystery of the Urim Ve-Tummum,” Jewish Bible Quarterly 43, no. 4 (2015): 241–245. 28. For information on the connection between Joseph Smith, his seer stone, and the name Gazelem, see Book of Mormon Central, “Why Was a Stone Used as an Aid in Translating the Book of Mormon? (Alma 37:23),” KnoWhy 145 (July 18, 2016); MacKay and Dirkmaat, From Darkness unto Light, 68–69. See also Alma 37:23–24; 2 Nephi 3:15. 29. It should also be noted that the truthfulness and accuracy of these ancient sources describing the biblical Urim and Thummim is questionable. Their correspondences with Joseph Smith’s translation instruments and methods are intriguing, but this alone doesn’t necessarily establish them as valid. 30. See Book of Mormon Central, “Why Does the Lord Speak to Men ‘According to Their Language’? (2 Nephi 31:3),” KnoWhy 258 (January 6, 2017).